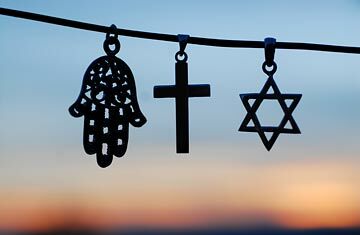 The launch of this comparative-religion site comes on the heels of a study released last week that found people in the U.S. switch their religious affiliations more than previously thought. Half of Americans have changed religions at some point in their lives, according to the Pew Research Center's Forum on Religion & Public Life, and the large majority did so by the age of 26  the perfect audience for online programming. He also notes a key difference between Beliefnet and Patheos: "We're multifaith, but for the most part, people use us to explain their own, rather than learn about other, religions," says Waldman. Which is why Patheos may be well supported among those whose religions have been broadly misunderstood. "Islam is this bogeyman," says Patheos contributor Jonathan A.C. Brown, a professor of Arabic and Islamic studies at the University of Washington, noting that people act as though "everyone has achieved some enlightenment, except for Muslims, who are stuck in the Dark Ages." For Muslims, he says, "to have a forum where their religion is going to be discussed seriously is important." Those problems were actually the impetus behind the founding of Patheos. The Brunnicks, who come from different Christian faiths, collectively have four small children from previous marriages, and when they wedded, they struggled to find help integrating their beliefs. "Bringing our kids together, deciding what to teach them and how and where to take them for Sunday school  we weren't taking this lightly," says Leo Brunnick. "In your 20s, it's easy to say, 'I'm spiritual, without specific tenets, whatever.' That feels great until you're staring into the eyes of a 2-year-old and realize you have to give them some moral compass." If they so choose, Patheos members can help set their own compass, customizing the site so they receive a stream of information relevant to their individual interests and, maybe, beliefs, à la Facebook. They can also contribute to the weekly debates via public discussion forums, which are monitored by both software programs and live editors to allow for free speech but not animosity. "Maybe the monopoly of clerical authority is threatened," says Brown, referring to a topic he'd like to address on Patheos. But in our diverse society, where people have increasingly been turning online for spiritual guidance, maybe it already has been. See pictures of Pope Benedict XVI visiting the U.S.
See pictures of John 3:16 in pop culture.